Fact And Fiction, this Norman Rockwell painting, appeared on the cover of Leslie's published January 17, 1917. An alternate title for this illustration is Old Man and Young Woman Reading. This was the second cover by Rockwell to appear on Leslie's. Only six Rockwell covers were published by Leslie's. Rockwell only submitted to this smaller magazine after the bigger publishers had declined to publish the cover illustration. This painting shows us several contrasts. 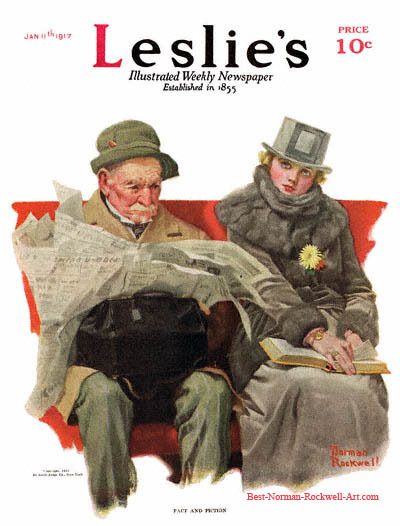 An old man and a young woman are sitting on a bench riding a commuter train. Old and young, man and woman, pretty and grizzled. The old man is wearing business suit under his overcoat. The young woman is fashionably dressed in a fur trimmed coat. She is also sporting a top hat and flower. Business and fashion. The old man is staring intently at his newspaper. The young lady is daydreaming, probably about a passage she has just read in her book. Concentration and imagination. The old man is reading a newspaper. The young lady is reading a book. Fact and fiction. The real question: Which is fact and which is fiction? It's not always easy or simple to discern the difference .